For context, this was watched the night after Valerian and the City of a Thousand Planets. Or, rather, re-watched, it having been seen any number of times over the past twenty years, not least at a 1998 open-air screening in London’s Hyde Park. It made for an interesting contrast, succeeding significantly better than Valerian, mostly because it demonstrates a key point about films with a strong sense of visual style. In order for them to work, the performances in them need to be equally strong, or they will be swept away by the sparkly distractions. 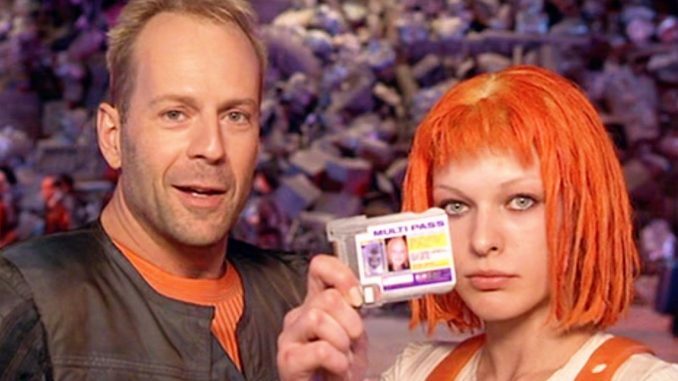 The latter is what happened in Valerian, and doesn’t here, thanks to Willis anchoring the film brilliantly – despite the significant handicap of having to wear a lurid orange vest for a good chunk, apparently chosen to match the hair of superpowered space girl Leeloo (Jovovich). His ex-soldier turned flying cab driver is down to earth and personable: the kind of guy with whom you could drink several beers. He gets drawn into the whole “saving the world” thing, after Leeloo literally drops into his cab. She turns out to be the key to defusing an onrushing extraterrestrial menace. Arrayed against them are the forces of industrialist Jean-Baptiste Emanuel Zorg (Oldman), who may be worth billions, but still apparently does his own hair. In the dark. With his left hand. Before trying to cover the results with a bit of Tupperware. He’s working at the behest of the mysterious and largely forgotten “Mr. Shadow”, and this lack of any real villain is probably the film’s greatest weakness. 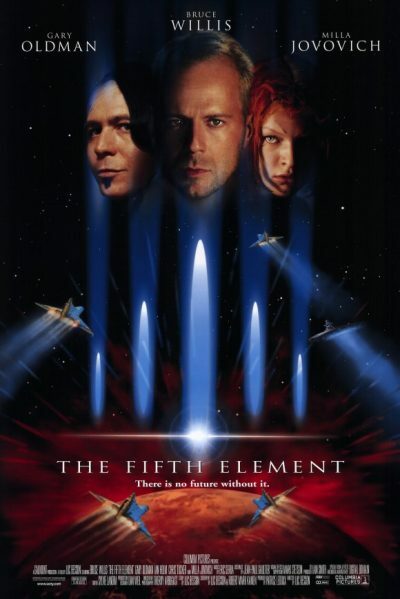 Why would Zorg, or anyone, actively work toward the destruction of the entire planet? I guess it’s because he’s a movie villain, and forethought has never been their great strength. Yet Oldman’s commitment to the role of villain sufficiently echoes the same he brought to Leon, for this to work, and it becomes easy to forget that, technically, Zorg is a henchman rather than the Big Bad himself. The rest meshes impressively, creating a credibly messy world that seems no less credible twenty years later, and the movie overall has aged well. There are occasions when the self-indulgence pokes through, such as the opera song (played by Besson’s then-wife, Maïwenn Le Besco – he left her during production for Jovovich, which must have been awkward). However, they’re so cool and memorable, you get why Besson left them in, and forgive him – though you can sometimes tell he started writing the script when he was 16. I must confess to absolutely hating Chris Tucker’s obnoxious DJ character, Ruby Rhod, at the time: I’ve defrosted somewhat since, perhaps because it appears he’s in it less than I remember. The result is a rare beast these days: big-budget, spectacle-driven SF, that’s wholly original in its source, rather than being adapted from an existing entity. Besson went his own way, with a vision in his head and the motivation to put it on screen. While the results aren’t universally successful, he can only be applauded for the effort.